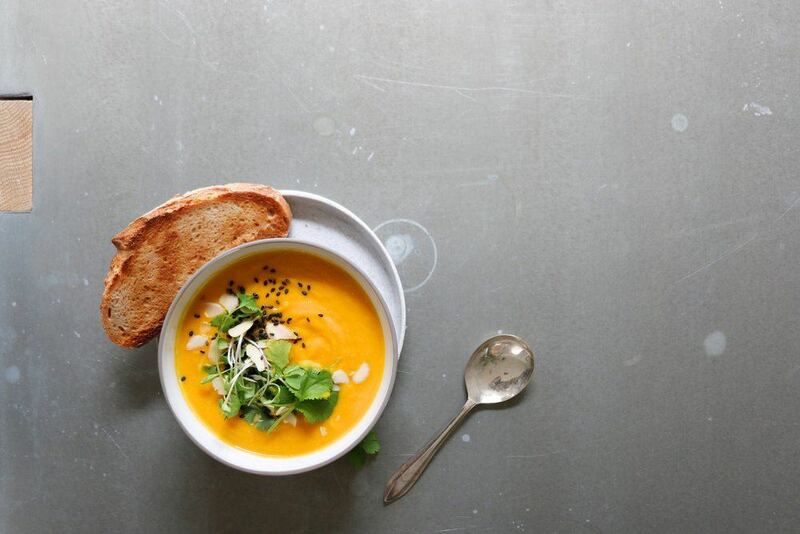 This is a simple, nourishing soup, with a fairly short list of ingredients and no real need to dress it up. It’s perfect for spring lunches or a solo supper. Sweet and salty in good proportions it turns humble carrots into the main event and has bright, zippy flavours from the ginger and miso. Miso is the secret probiotic super hero in this dish, delivering healthy fermented bacteria to the gut and supporting our digestive microbiome. Be sure not to destroy the beneficial bacteria by adding to the soup while piping hot so wait until serving temperature to stir through. Heat a large splash of oil in a non-stick, heavy bottomed pan. Gently and slowly cook the onion, for around 20 minutes until soft and sweet. Once the onion is translucent add the garlic and ginger, stirring and allowing to cook for a few minutes. Stir through the white miso while hot but not boiling. Serve with a chunky slice of sourdough, coriander and sesame seeds.